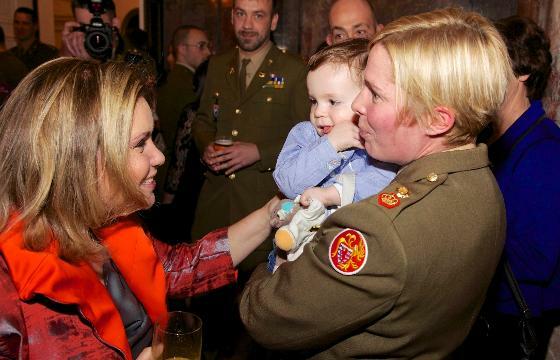 Grand Duke Henri and Grand Duchess Maria Teresa as well as Hereditary Grand Duke Guillaume and Hereditary Grand Duchess Stephanie welcomed members of the Luxembourgish army and the police at the Château de Berg today. All the soldiers and policemen participated humanitarian and peacekeeping missions, specifically KFOR and ISAF, this year. Luxembourgish forces have been part of the NATO-led KFOR (Kosovo Force) since January 2000. 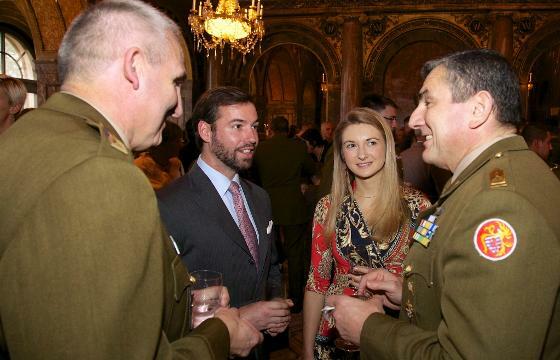 A few years ago, Princess Tessy served time in the South-Eastern European country as part of one of the missions and it is actually where she met her prince when he was visiting the troops. Since July 2003, Luxembourg is also taking part in another NATO mission, the Afghanistan-based ISAF (International Security Assistance Force). The reception traditionally take place every year just before Christmas at the residence of the Grand Ducal Family. Policemen and soldiers who have taken part in two two above mentioned missions as well as their wives, girlfriends, children, parents and basically everyone you want to bring are invited to attend. During the reception the guests mingled with the Grand Ducal as well as the Hereditary Grand Ducal couples at the grand dining room and the ceremonial hall. A gallery of visuals is available at Wort.